Kishio Gosei Yamaguchi was undoubtedly one of the finest Masters of Karate-do that we have had the honour to train with , albeit briefly. Gosen Shihan's death in 1990 approximately one year after his father Jitsumi Gogen Kaiso, was the greatest shock to all of us, and especially so to his mother Midori Yamaguchi, and his siblings, Hirofumi Goshi, Norimi Gosei, and Wakako. The pain etched indellibly into the face of Goshi Shihan as he discussed the tragic loss of his dear brother is testament enough to the esteem to which he was held within his own family. Gogen Kaiso was obviously very proud of Gosen Shihan as he was of all of his children. He was especially proud of the fact that Gosen Shihan somehow managed to juggle his enormously stressful job as Vice President of Japan Airlines, with his responsibilities as a Shihan of the Suginami World Headquarters Dojo of Goju Kai. Gosen Shihan had followed his younger brother Goshi Hirofumi Yamaguchi to the USA in 1963 and took over the classes at the Dojo in San Francisco State College in the Summer of 1963 where Goshi Shihan had commenced teaching. It was at that time that the U.S.A. Goju Kai was introduced to America as a group within the International Karate do Goju Kai Association and Gosen Shihan was the first Goju Kai practitioner to become known in that Country. He departed the U.S. in order to return to help his father to teach classes at the Honbu Dojo, which had become very hectic since his departure. Gosen Yamaguchi Shihan was the second son of Jitsumi Gogen Yamaguchi and his wife Midori Yamaguchi. He was born in Manchuria in 1940 at approximately the same time that his father Gogen was captured an imprisoned in Siberia during World War Two. He remained in Japan until his marriage in 1966 whereby he travelled once again back to San Francisco briefly to visit with his brother Norimi Gosei Yamaguchi who had taken over the Goju Kai Dojo from him. Gosen Shihan was employed as an executive by Japan Airlines and during the period 1968- 1971 he worked his way to the very top of the Company being promoted to Vice President of Japan Airlines [JAL] after stints in Frankfurt and Europe. 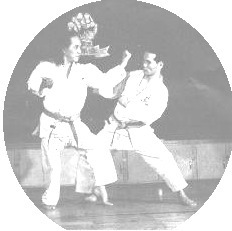 During this time period Gosen steadfastly promoted the Japan Karate do College [Nihon Karate do Senmon Gakko] and supported his Father Gogen and brother Goshi in everyway possible: this was especially true with regards to Sponsorship via his company, and also in his teaching capacity which was extensive. After the passing of Gogen Yamaguchi Kaiso it was the common desire of the two brothers Gosen and Goshi Yamaguchi, to divide between them the role of managing the vast empire association that was the IKGA with over 200,000 members throughout the world. Gosen shihan took over the role as President of the Associations Japan Karate do Goju Kai Association JKGA and IKGA, and Goshi Shihan was accordingly elevated to Saiko shihan by all of the Senior 9th Dans in the group in Japan, most of whom were much older and senior to himself and who were unanimous in their decision. This role encompassed all Technical aspects regarding Kata, Bunkai, and development of rules, regulations and future progressions etc. It was a great shock of all of us that within one year (12 months), of his father's decease Kishio Gosen Yamaguchi also passed away suddenly after a short but severe illness in 1990 at the age of 49 years. This was an enormous shock to the Yamaguchi family and the IKGA world & for the whole organization of the Goju Kai. We all mourned his loss and determined to remember every small detail that he passed on to the Shihan instructors regarding technical and other details regarding the structure of the IKGA. Prior to Gosen Shihan's illness Paul Starling Shihan had attended a training Seminar for Instructors in Japan with his wife Sandie, where Gosen Shihan taught the 'old style' of Goju Ryu that they were both so familiar with. It was the type of training that Paul had learned at the Honbu Dojo in Japan and that he had emulated in his Sydney Goju Kan Dojo. Afterwards Gosen Shihan discussed many of his ideas for the future of the Association with Paul , and he has remembered much of this discussion. It was Gosen Shihan's idea that ranks within the IKGA/ JKGA should only proceed as far as 6th or 7th Dan, afterwhich the only grade progression from there on would be Menko to Menkyo Kaiden. There is a photographic record available of the training session and the party and meeting afterwards; these will be uploaded to this site shortly. It was after his brother Kishio Gosen's decease that Hirofumi Goshi Yamaguchi was requested by the senior instructors of the Association, to assume the role as President of the IKGA/JKGA which he assumed in 1990 with a sad heavy heart in the name of his father & beloved brother. Gosen Yamaguchi is remembered and greatly respected for his gentle unassuming nature, his wisdom, as well as his precice, effective yet beautiful flowing and typical 'goju ryu' technique style, and his enormously dedicated and hard working attitude to his duties of the IKGA and his career with Japan Airlines. He will certainly never be forgotten by those who trained with him and under his guidance, and especially so by his Mother Midori, and his siblings Hirofumi Goshi, Norimi Gosei and Wakako.